Election Day is THIS TUESDAY, August 28th! 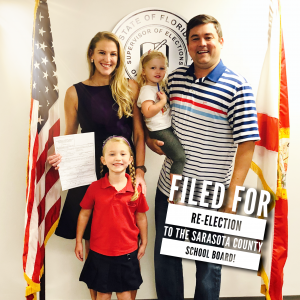 Bridget Ziegler, Chairman of the Sarasota County School Board, is currently seeking re-election to continue serving the best interest of all stakeholders, including students, parents, families, teachers and all taxpayers. 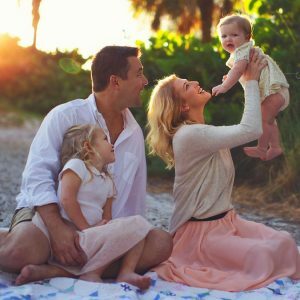 Bridget was first elected to the Sarasota County School Board in 2014, after being appointed by Governor Rick Scott to fill a vacancy. During her four years on the board, she has been a successful champion for hard fiscal responsibility, transparency, and #StudentFirst policies. Bridget was always active in her community, predominantly focused with local nonprofits. But as with any parent, once she had a child, her priorities and reason for living changed dramatically. With the birth of her daughter, Reagan, Bridget had a newfound sense of meaning: ensuring all families had access to high-quality education options. The combination of her business acumen and passion for children is what has allowed her to be effective in serving her community, with a focus on what matters – the STUDENTS. Throughout the four years of her service, she has been a voice for parents on the School Board and has assisted countless families navigating the various roadblocks and bureaucracy to ensure their problems are addressed promptly and in the best interest of the children. Championed school safety and security enhancements in 2015 to become part of the five-year Capital Improvement Plan’s priorities – including single point entry. Appointed to serve on Governor Rick Scott’s School Safety Workshop, which resulted in her recommendation of the state having a baseline standard of security guidelines, an update of OPPAGA, and audits to ensure compliance. Pushed for streamlined Risk Management Procedures to be adopted at every school site. Championed the closure of School Avenue at Sarasota High School. Every decision Bridget make starts with one question – What is in the best interest of the over 43,000 students in Sarasota County? The focus of education shouldn’t be on the “system”, but instead solely focused on every single individual child and what we can do to help teach, shape, and guide them towards a successful future. Bridget has and will always put the needs of our #StudentsFirst! Championed fairness by grandfathering students when amending class weighting and student progression plans. Championed transparency and equity for students by promoting school choice options (Charter School Information, School Choice Open Enrollment, Dual Enrollment). Founding Member and President of the Florida Coalition of School Board Members (FCSBM), an organization dedicated to focusing on the needs of each individual student and empowering parents. Streamlined the administrative process for student referrals to ensure fairness and transparency. Instituted an audit and review of hiring process. Streamlined the online system for volunteer sign up, thus increasing volunteer engagement. Instituted an Independent Negotiator for Teachers Union Bargaining Contract Negotiations. Secured an annual savings of $200,000 by updating the School Insurance Brokerage Procurement Policy and requiring an RFP at a minimum of every five years. Provided increased financial review and oversight by requiring that any improvement over $150,000 on a non-instructional structure be brought before the board for approval. Implemented financial safeguards, such as ensuring that any expenditure that exceeds the previously approved bid contracts’ “not to exceed threshold” now requires the board approval. (Prior to this requirement being in place, the process was to simply notify board members by email and no approval was necessary). Increased transparency and public access by moving School Board Workshop Meetings from an obscure conference room without cameras to the School Board Chambers with cameras. Allowed “The People” to have direct access to the discussions, proposals and decisions of their School Board by requiring that all School Board meetings and workshop meetings be televised, live streamed and online archived. Increased public access and awareness of upcoming proposals, discussions and votes by requiring the attachment of supporting documents to the online agenda. Blocked placement of any item to the Consent Agenda that does not have supporting documents, so that there is increased review and transparency for the public. Increased transparency by requiring that all construction projects/capital improvement plans be identified by name. With an annual budget of over $800,000,000 (yes, $800 million), 52 schools, 5,000 teachers & staff and over 43,000 students, the Sarasota County School District is a massive organization and can be intimidating/difficult to navigate. To help address this challenge, Bridget has always made herself available to every taxpayer, parent, staff member and student who has questions, needs additional information, provides feedback or needs help navigating THEIR school district. Championed the removal of the Teachers Union’s use of the official School District email server. The Teachers Union now operates on their own server. Aligned the Strategic Goals & Superintendent Evaluation Tool to Measurable Metrics. Embarked on a full-scale School Board policy review for regulatory compliance and procedural accuracy. Updated the Textbook Adoption Process to ensure public review, input and transparency at the local level and worked with the State Legislature to adopt similar policies statewide. Implemented a Review and Restructure of the School District’s Equity and Harassment Policy, which increased the integrity of the process. Restructured the District’s 7.71 Construction Procurement Process. Updated Insurance Brokerage Procurement Policy, requiring an RFP at a minimum of every five years. This process resulted in an annual savings of $200,000. Updated Texting Policy to align with Public Records Laws and reduce District Liability.